2014 Spirit of West Africa Press Release & Schedule! Friday, April 25, 2014, Seattle, WA. 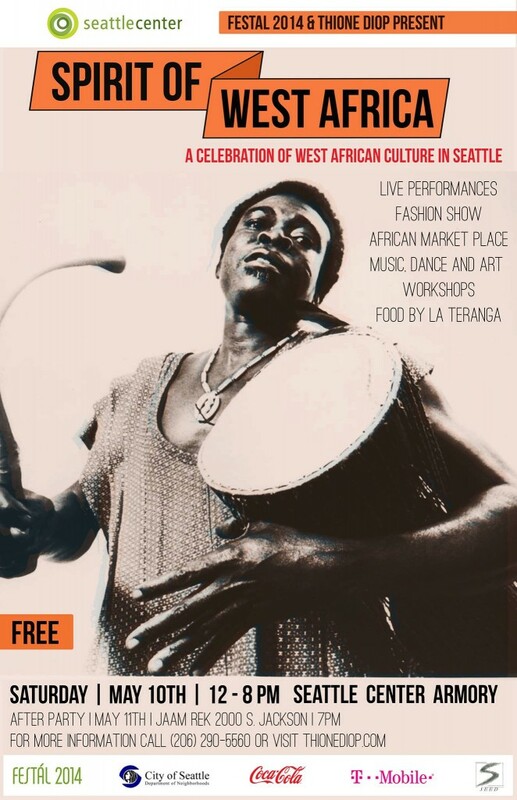 Thione Diop and Seattle Center FESTAL are proud to present the 9th Annual Spirit of West Africa Festival on Saturday, May 10, 2014 at the Seattle Center Armory from 12:00 to 8:00 pm. Showcasing the profound creativity and cultural resilience of peoples of West African origin and descent, The Spirit of West Africa will present a vibrant and unique celebration featuring unparalleled music and dance performance, an African marketplace, an art gallery, a fashion show and traditional Senegalese cuisine, not to mention free dance workshops. Under the direction of Senegalese-born griot and percussionist Thione Diop, The Spirit of West Africa honors a myriad of music and dance traditions practiced by West African artists. This years’ exceptional program features world-renowned guest performers representing Mali, Senegal, Gambia, Nigeria, Guinea, and Congo. As the Festival also acknowledges the vast influence of West African performance traditions throughout the African Diaspora, 2014 performers include local Honduran artists sharing music and dance from the Garifuna cultural repertoire. Northwest audiences are incredibly fortunate for the opportunity to witness Wawali Bonane (vocals), Dodo Munoko (vocals), Huit Kilos (guitar), Modero Mekanisi (saxophone) and Shaba Kahamba (bass), former members of the legendary Orchestre Afrisa International from Democratic Republic of the Congo. For over thirty years the band was led by Tabu Ley Rochereau, one of the most popular and prolific African singer-songwriters of the 20th century, who pioneered soukous by fusing traditional Congolese music with rumba. The Spirit of West Africa pays homage to highly influential Tabu Ley, who passed in November 2013, leaving an indelible imprint on the work of countless artists who follow in his stead, not to mention listeners across the globe. Yacouba Sissoko is a master kora player from the Malian Djely griot tradition who has performed and recorded across the globe with artists such as Regina Carter, Baaba Maal, Harry Belafonte and Paul Simon. Sissoko’s virtuosity will be matched by the guest members of his band—Abdoulaye Diabate (Mali; vocals & guitar), Bailo Bah (Guinea; flute) and Fomoro Dioubate (Guinea; balaphone)—a powerful combination that local fans won’t want to miss. The Spirit of West Africa is privileged to welcome Foday Musa Suso, the versatile and acclaimed griot, kora player and composer from Gambia. Suso has played alongside Jack DeJohnette, Paul Simon, and Herbie Hancock, among others. Hailing from Senegal, the Seattle-based Diop family—Mapathe Diop, Thione Diop, and Gora Diop—will accompany international guest Masamba Diop, the master tama (talking drum) player for Baaba Maal. Massamba has recorded and shared the stage with James Brown, Herbie Hancock and Carlos Santana. The Northwest non-profit organization Udoka Cultural Dance will be bringing Ibgo music and movement traditions from Nigeria directly to Seattle audiences. Udoka features Igbo dances and traditional attire punctuated by percussion from Eastern Nigeria. We are fortunate to count Udoka amongst our performers this year. The Spirit of West Africa is also excited to present local Honduran ensemble Hagucha Gariñagu under the direction of Ricardo Guity. Hagucha Gariñagu features music of the Garifuna people, including the rhythms ofPunta, Guanaragua, Paranda and Dugu. Guity himself began as a prodigy of the renowned African master drummer, Babatunde Olatunji, and has since collaborated with such major artists ranging from Youssou N’Dour and Ibrahima Camara, to Celia Cruz, Johnny Pacheco and many more. Lastly, among the most dynamic and interactive components of the festival are the free community dance workshops. The 2014 festival features an intensive dance class from Ghana led by Obo Addy’s Okropong, and a Cameroonian dance workshop by Vancouver-based Jacky Essombe. Local sculptor Marita Dingus will be leading free children’s art activities from 1:00 to 6:00 PM. Furthermore, an exquisitely curated Fashion Show hosted by Nansare Consolata and Best of Both Worlds will exhibit fine apparel and inimitable African aesthetics that are at once cosmopolitan and traditional. And finally, for those interested in sampling traditional cuisine Columbia City’s own La Teranga will be providing a variety of tasty Senegalese dishes. Admission to The Spirit of West Africa is free as part of Seattle Center’s Festal Series, so please feel welcome to attend with family members and friends of all ages, and join us in celebrating this display of ancient knowledge and its modern expressions that thrive throughout the Pacific Northwest. FESTAL and The Spirit of West Africa are grateful to our sponsors for helping bring world-class arts experiences directly to Pacific Northwest audiences. Spirit of West Africa also welcomes audiences to join us for a special Festival after-party on Sunday, May 11, 2014 from 7:00pm to 1:00am at Jaam Rek Studios, 2000 S Jackson Street, Seattle, WA 98144. Live music and dancing will abound. For more information call 206 290 5560 or visit http://www.thionediop.com.